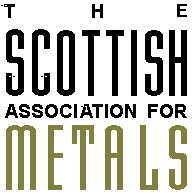 The Scottish Association for Metals is the direct successor of the West of Scotland Iron and Steel Institute. The Association is the learned society and professional institution for metallurgists and materials technologists in Scotland. It organises a programme of technical meetings and visits to inform and update those working in manufacturing industries, education and training about current developments and practices in materials technology. It is also a recognised Scottish charity (charity number SC014102). Through careful management of a portfolio of investments, the Association is able to offer grants to individuals in need of funding to support professional development activities. SAM is also able to support the award of prizes for good students of engineering materials technology. Organisations seeking funding for prizes should contact the secretary. The Association is managed by a Council which is elected from its membership. The history of the Association goes back to 1892 with the establishment of the West of Scotland Iron and Steel Institute in Glasgow in order to promote the science and technology of the manufacture and use of iron and steel. It has strong links with other professional engineering and technical societies in Scotland and the UK.